As winter’s coming, you might find some more time to grab a book and learn about our democracies in the digital age. We have curated our favourite list of recently released books exploring how the Internet will (not) save democracy. Take a sip from your coffee and enjoy your reading time with these books! Two core components of liberal democracy—individual rights and the popular will—are increasingly at war with each other. As the role of money in politics soared and important issues were taken out of public contestation, a system of “rights without democracy” took hold. Populists who rail against this say they want to return power to the people. 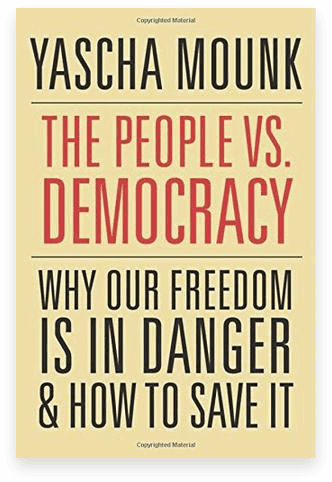 But in practice they create something just as bad: a system of “democracy without rights.” The consequence, as Yascha Mounk shows in this brilliant and timely book, is that trust in politics is dwindling. Citizens are falling out of love with their political system. Democracy is wilting away. Drawing on vivid stories and original research, Mounk identifies three key drivers of voters’ discontent: stagnating living standards, fear of multiethnic democracy, and the rise of social media. To reverse the trend, politicians need to enact radical reforms that benefit the many, not the few. 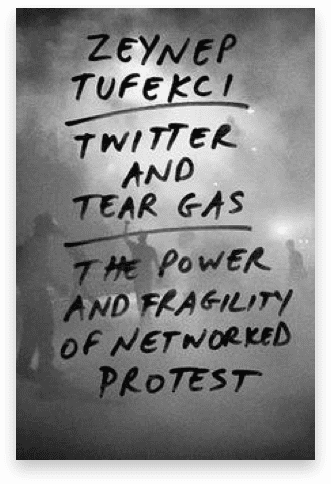 Tufekci describes how the internet helped the Zapatista uprisings in Mexico, the necessity of remote Twitter users to organize medical supplies during Arab Spring, the refusal to use bullhorns in the Occupy Movement that started in New York, and the empowering effect of tear gas in Istanbul’s Gezi Park. These details from life inside social movements complete a moving investigation of authority, technology, and culture—and offer essential insights into the future of governance. 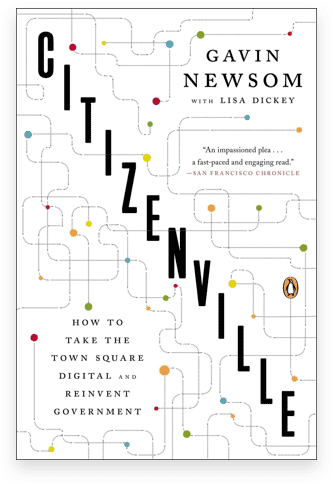 Citizenville is the story of how ordinary citizens can use new digital tools to dissolve political gridlock and transform democracy. As social networking and smart phones have changed the way we communicate with one another, these technologies are also changing our relationship with government. In a world where people can do anything at the touch of a button—shop, communicate, do research, publish a blog, transfer money—government cannot keep functioning in a twentieth-century mind-set. Lieutenant Governor Gavin Newsom explores the many ways in which technology can transform government and empower citizens: Opening up vast troves of government data, then letting people create apps to use them wisely. Harnessing the popularity of online games to establish a kind of “Angry Birds for Democracy.” Inventing new feedback loops so people can take active part in every facet of governing. 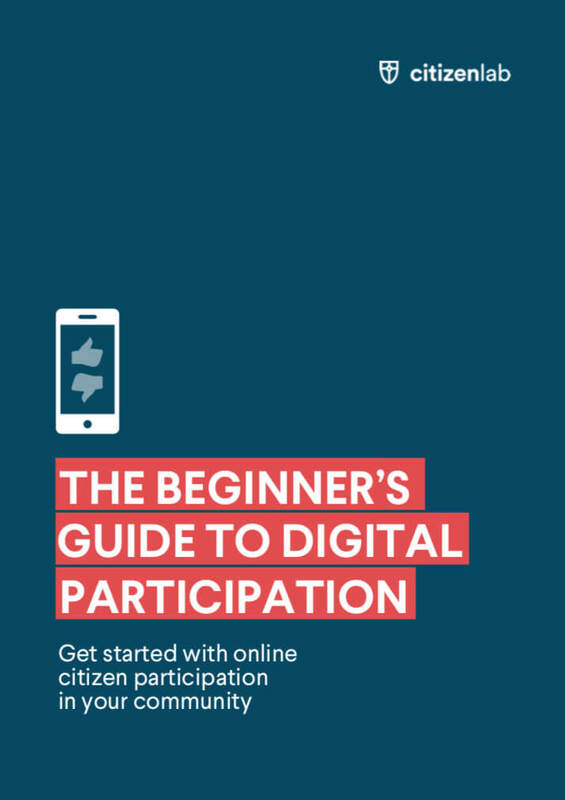 A rousing call to action for those who would be citizens of the world—online and off. We live in an age of connection, one that is accelerated by the Internet. This increasingly ubiquitous, immensely powerful technology often leads us to assume that as the number of people online grows, it inevitably leads to a smaller, more cosmopolitan world. We’ll understand more, we think. We’ll know more. We’ll engage more and share more with people from other cultures. In reality, it is easier to ship bottles of water from Fiji to Atlanta than it is to get news from Tokyo to New York. 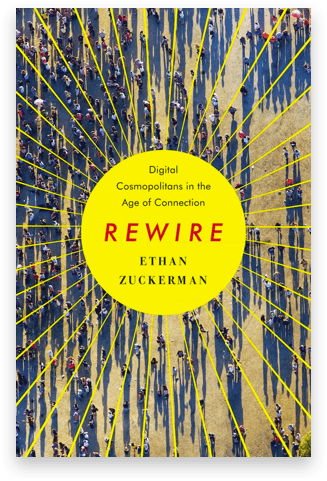 In Rewire, media scholar and activist Ethan Zuckerman explains why the technological ability to communicate with someone does not inevitably lead to increased human connection. At the most basic level, our human tendency to “flock together” means that most of our interactions, online or off, are with a small set of people with whom we have much in common. In examining this fundamental tendency, Zuckerman draws on his own work as well as the latest research in psychology and sociology to consider technology’s role in disconnecting ourselves from the rest of the world. A bracing, revelatory look at the demise of liberal democracies around the world–and a road map for rescuing our own. Donald Trump’s presidency has raised a question that many of us never thought we’d be asking: Is our democracy in danger? Harvard professors Steven Levitsky and Daniel Ziblatt have spent more than twenty years studying the breakdown of democracies in Europe and Latin America, and they believe the answer is yes. Democracy no longer ends with a bang–in a revolution or military coup–but with a whimper: the slow, steady weakening of critical institutions, such as the judiciary and the press, and the gradual erosion of long-standing political norms. The good news is that there are several exit ramps on the road to authoritarianism. The bad news is that, by electing Trump, we have already passed the first one. 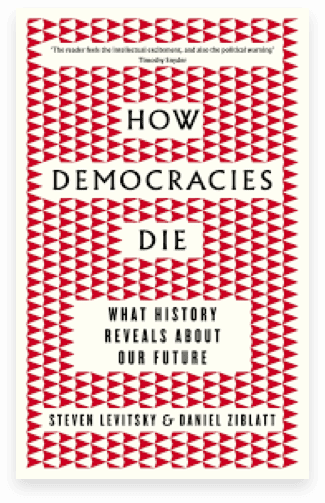 Drawing on decades of research and a wide range of historical and global examples, from 1930s Europe to contemporary Hungary, Turkey, and Venezuela, to the American South during Jim Crow, Levitsky and Ziblatt show how democracies die–and how ours can be saved. 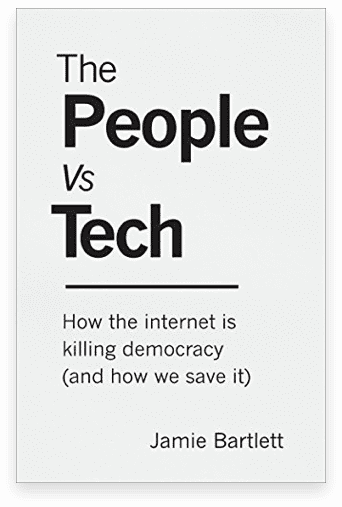 The People Vs Tech is an enthralling account of how our fragile political system is being threatened by the digital revolution. Bartlett explains that by upholding six key pillars of democracy, we can save it before it is too late. We need to become active citizens; uphold a shared democratic culture; protect free elections; promote equality; safeguard competitive and civic freedoms; and trust in a sovereign authority. 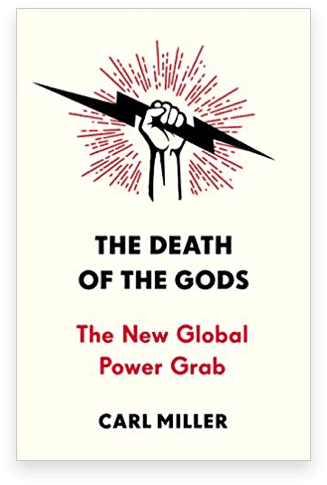 This essential book shows that the stakes couldn’t be higher and that, unless we radically alter our course, democracy will join feudalism, supreme monarchies and communism as just another political experiment that quietly disappeared. We live in the age of the algorithm. Increasingly, the decisions that affect our lives—where we go to school, whether we get a car loan, how much we pay for health insurance—are being made not by humans, but by mathematical models. In theory, this should lead to greater fairness: Everyone is judged according to the same rules, and bias is eliminated. But as Cathy O’Neil reveals in this shocking book, the opposite is true. The models being used today are opaque, unregulated, and uncontestable, even when they’re wrong. Most troubling, they reinforce discrimination: If a poor student can’t get a loan because a lending model deems him too risky (by virtue of his race or neighborhood), he’s then cut off from the kind of education that could pull him out of poverty, and a vicious spiral ensues. 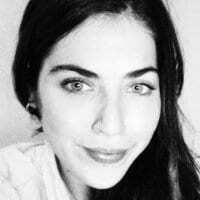 Models are propping up the lucky and punishing the downtrodden, creating a “toxic cocktail for democracy.” Welcome to the dark side of Big Data. Tracing the arc of a person’s life, from college to retirement, O’Neil exposes the black box models that shape our future, both as individuals and as a society. Models that score teachers and students, sort resumes, grant (or deny) loans, evaluate workers, target voters, set parole, and monitor our health—all have pernicious feedback loops. They don’t simply describe reality, as proponents claim, they change reality, by expanding or limiting the opportunities people have. 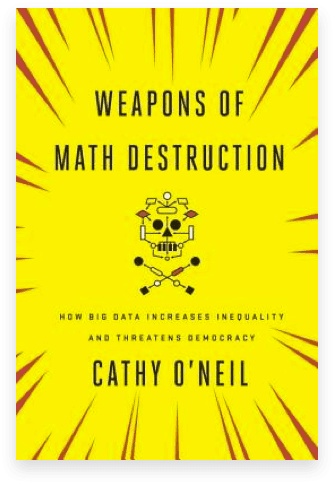 O’Neil calls on modelers to take more responsibility for how their algorithms are being used. But in the end, it’s up to us to become more savvy about the models that govern our lives. This important book empowers us to ask the tough questions, uncover the truth, and demand change. The only fiction book that made it to this list! Disco Sour questions where our democracy is going in an era of ubiquitous data. 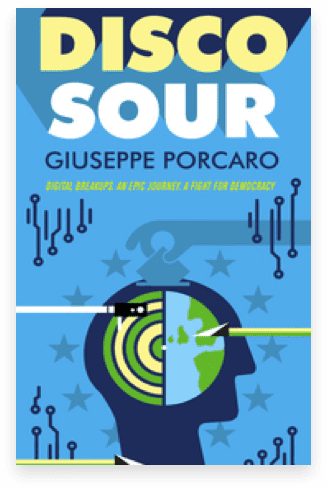 Read the interview we did recently with the Giuseppe Porcaro, the author of Disco Sour, about Internet democracy. In the aftermath of a continental civil-war, nation-states have collapsed, the European Union™ holds on, preventing anarchy. Bastian Balthazar Bux is a leading member of The Federation®, the European network of civil society and local governments. Bastian has just been unexpectedly dumped through an app, the BreakupShop™ service. Heavy hearted, he just wants to drink, get on with work and forget his romantic woes. However, he discovers that Nathan Ziggy Zukowsky is planning to sell Plebiscitum®, a dating-style app that is meant to replace elections with a simple swipe, at the same conference he is invited to attend in Chile. Haunted by the ghosts of his recent relationship, he finds himself without his all-important Morph® phone, just a few hours before embarking on his trip to try to save democracy. Will he make it to his conference on the other side of the world? Will he stop Zukowsky from selling his app? And will he ever find a way to deal with his breakup? Democracy is in bad health. The symptoms are familiar: the rise of fear-mongering populists, widespread distrust in the establishment, personality contests and point-scoring in place of reasoned debate, slogans instead of expertise. Against Elections offers a new diagnosis – and an ancient remedy. 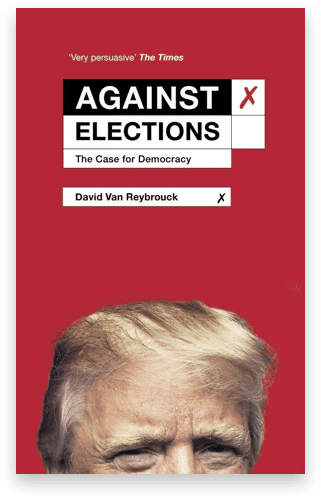 In this ingenious book, David Van Reybrouck reminds us that the original purpose of elections was to exclude the people from power by appointing an elite to govern over them. He demonstrates how over time their effect has been to reduce the people’s participation in government to an absolute minimum, ensure power remains in the hands of those who already wield it, and force politicians to judge policies not on their merits but on their likelihood to win or lose votes. And that’s when elections go well. Yet for most of democracy’s 3000-year history governments were not chosen by election at all: they were appointed, much like the jury system, through a combination of volunteering and lottery. Drawing on vast learning, an international array of evidence and a growing number of successful trials, Against Elections demonstrates how a sophisticated and practical version of this ancient system would work today and thus eliminate the underlying cause of democracy’s sickness. P.S. Do you have any other book tips for us to include in this list? Let us know by tweeting us @citizenlabco! P.S.S. Would you rather read about urbanism and the future of our cities? We curated a list on our best reads in this field too.